Wow, so it’s that easy to build something like this these days… Maybe even someone like me could give it a shot for giggles. It’s amazing what these flight controllers are capable of at this point. Within reason, the design doesn’t need to even be symmetrical. The controller will pick up the discrepancy and compensate for it automatically. frame flex is really a unique problem for control. Not very much – I kept the layer quite narrow as I didn’t want huge blobs of melt glue unbalancing everything. I actually thinned it down with the side of the glue gun’s nozzle to keep it more-or-less level. 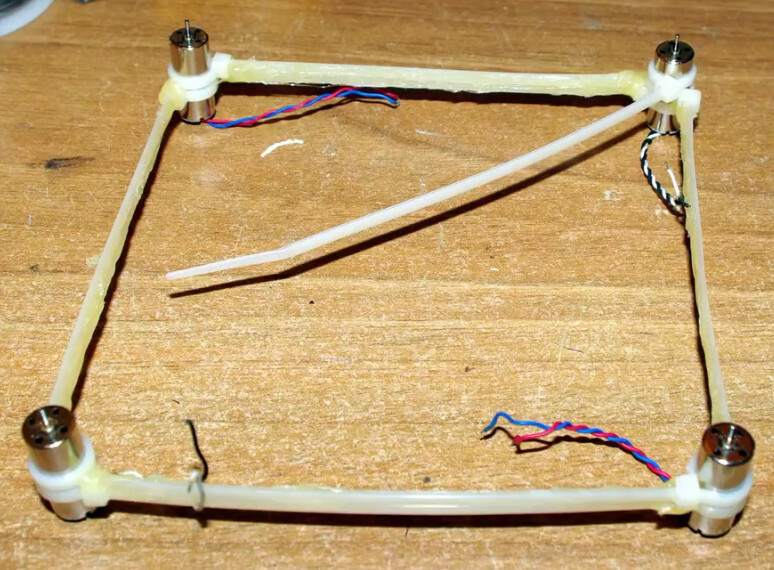 Drinking straws filled with glue would stiffen up the frame. I don’t think you could fill them with melt glue. As you pumped it in the glue furthest from the gun’s nozzle would solidify and you’d just end up with glue overflowing from the straw after only filling it up partially. You’d need some other kind of adhesive to do this – preferably something that doesn’t need air to cure, since it’d have to do so in a sealed environment – and I don’t have any such advanced adhesives. As well, a glue-filled straw would be quite heavy. How about using Heat shrink tubing that has a “hot glue” inside it? What about a hot-glue gun with a long nozzle? Get them quick before they are banned ! At that point might as well use cheap chinese takeout chopsticks for framing. Too extreme. Bend Aluminum wire frame and glue/screw it to motors. His hot glue layer is even heavier than any metal frame. The QX90 uses the same motors but smaller propellers, and there is more airflow interference from the arms. Which means that, if I can reach such a thing as a stable tune, my tiny abomination ought to *significantly* outperform a QX90. Mind you, I leave open the possibility that the bendy frame might never actually allow for stable flight to happen at all, but I have to test further before making any claims one way or the other. As for your idea, aluminium wire would bend with functionally no effort under the smallest impact, and – in contrast to zipties – wouldn’t snap back to its original shape. “tensegrity quadcopter” search returns nothing that would fit that description. Why try to redesign an element optimized for tension to work in compression when you can use this ‘weakness’ to its strength? Hey there, I’m the one who built this quadcopter. As a long time Hackaday reader (how long? Well, when I started the pictures in the main page were still in black and white…) I’m so glad to finally have an article written about something I made! The frame has survived several crashes with no damage (so far). I really need to tune it – though I’m not much good with anything that involves numbers, so it might take me a while to get the PIDs right. Do you think it could be scaled with larger or smaller zip-ties? What was the cost of the overall drone? 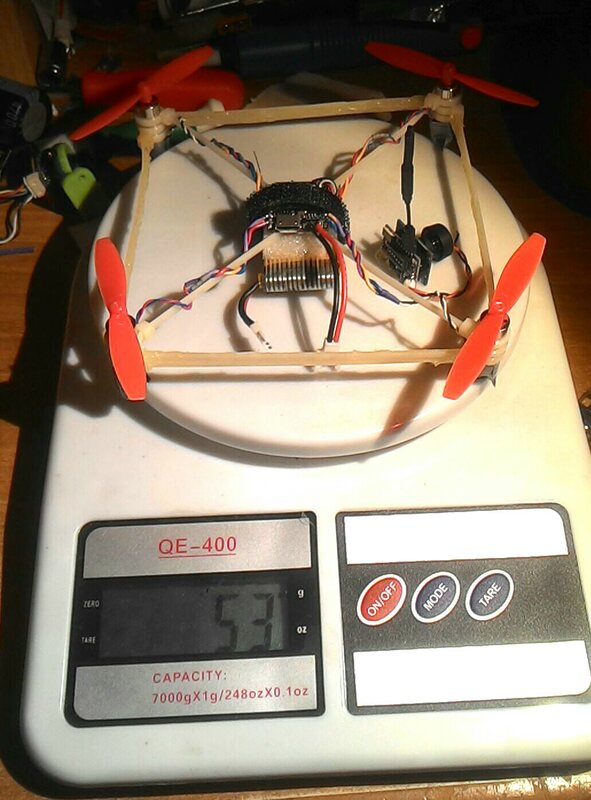 Around 55 grams, give or take: http://i.imgur.com/aDfThV2.jpg (the scale is not very precise and I’ll need some glue to affix the camera, hence the rounding). Functionally the same weight as a stock QX90 – which, notably, uses smaller propellers. The cost was very cheap: aside from the frame, whose cost is effectively irrelevant, the parts came from when Banggood did a flash sale for QX90 quadcopters; they went from $60 to $25 and I bought four to stock up on parts – at the time I only needed the flight controller, but the difference between buying four special-deal full quadcopters and four full-price controllers was only a few dollars, so I went for it and ended up with a ton of parts. At full current prices you’d pay $15-20 for the controller, $3 or so for the battery, $5 for the motors (Fasttech has them cheaper than Banggood) and a buck or two for the propellers. I imagine you could upscale, but you’d also have to upscale the powerplant, which would mean going brushless – 8.5mm motors like these are the largest brushed motors it makes sense to buy; there do exist larger 10mm ones as well as upgraded 8.5mm ones, but they are quite expensive and don’t have *that* much more thrust. Going brushless would add significant challenges: you’d need somewhere to put the ESCs, for starters, and since the motor’s casing spins you couldn’t tighten the zipties around them like I did here so you’d need to come up with some kind of zip-tiable motor mount. Yeah, because that’s definitely the point. Why even bother to comment with nonsense like this? Ive seen the cardboard box quad, that was built out of the box the guy’s new FC board came in, while he was waiting for the replacement frame to come in. Flew like @ss but it sorta worked. With more cutting probably wouldve flown better for a few minutes before something creased.